In a large pot of boiling water, drizzle about 1 tablespoon of oil and 2 teaspoons salt. Add pasta and cook according to package instructions. In a large skillet over medium heat, melt the butter and olive oil. Add the garlic and sauté for 1-2 minutes. Don't burn garlic. Add the shrimp, salt, pepper and red pepper flakes. Sauté and stir just until the shrimp turns pink, about 2-3 minutes. Add spinach, parsley, lemon juice and lemon zest. Toss to combine. 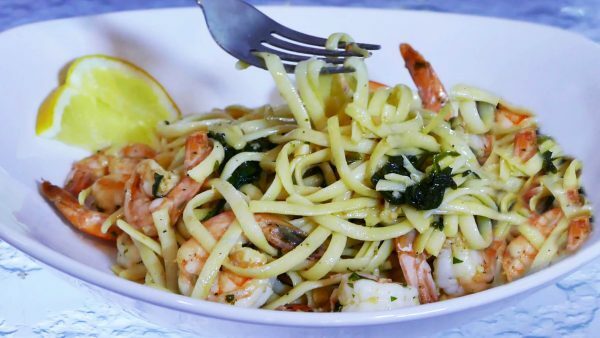 Drain cooked pasta, add to shrimp and lightly toss. Add cup of heavy cream or half and half and toss gently. Serve with ribbons of parmesan and lemon slices.